After going underground for half a year, the Knights of Amerun Hill revive when their leader King Harry announces their return. Unfortunately he does so in the middle of the Town Fair where all authourities wanting the Knights gone and dead are present. Now, they are on the run and heading for the Escabar Ruin where they will make their stand, and start planning how to impeach Harry. Your job is to make sure they stay alive and defeat the antagonist, Lord Arnold. • and hopefully some replay value! Similar to "My fort - my empire" by the same creator, The Escabar Ruin is a short defend-the-spot style scenario. It requires shrewd micromanagement and a pre-planned battle to stay alive. The frantic gameplay keeps the player on his toes for the duration, and it is very enjoyable to fight wave after wave of enemies. While the game is short, it is often cut too short. It is very difficult to survive after the first boss, even with both towers intact. The problem is having so many heroes, you don't have an army, but you have enough that it sometimes gets hard to keep track of them all. This can lead to one running off and causing you a great deal of problems. After your first hero dies, you really don't have much longer to last. This is disappointing, as "My fort- my empire" did much better in this respect. The former gives the player gates, which allowed the player both respite and the ability to resist melee attacks. 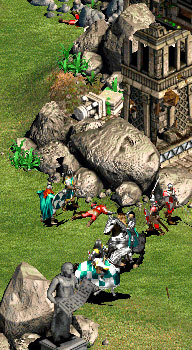 The player is presented with a variety of soldiers, most of which are non-ranged cavalry. This gives the player freedom to experiment on the tactics they employ. While I chose to sally forth and carefully eliminate archers, there are many other ways the player is offered. There is a monk, which helps to even the numbers, by a minuscule amount. A variety of enemies will come and assail you, while the "Boss" feature adds further diversity. The experience system works very well in keeping the player alive. The map was very well done, with a short cutscene to the north through a well-designed forest, right up to the last stand in a ruined fortress. The elevation greatly helps the player in his fight. The story is where the game excels, with a long aftermath following the battle. The instructions are concise, but more than enough to help the player. A somewhat disappointing sequel, The Escobar Ruin is inferior to its predecessor. I would suggest the difficulty be modified, certainly the way that 2x units often means more than 2x difficulty. There are more spawning points in this game, and the enemy arrives at an alarming rate. The Escobar Ruin is the stand-alone sequel to Lord Basse's other award-winning scenario, My Fort - My Empire. It is a very fun Defend-the-Spot type scenario, and a highly recommended download. To put it quite simply, The Escobar Ruin is a blast to play. Aided by some very fitting music and a well-designed map, the arcade-style gameplay remains as fun as it was in his previous scenario. The usual defending portions were interrupted by interesting boss fights that broke whatever monotony might have built up. Overall, the playability is excellent. By the very nature of the DtS genre, balance is rarely an issue, since in most cases (such as this one) the difficulty increases as time passes. This ensures that even the most inexperienced player can survive for a time, while advanced players also have something that tests their ability. The Escobar Ruin does this well, providing an easy beginning while ramping up the difficulty as the rounds pass. However, the problem that kept this scenario from receiving a 5 in this category is the poor transition between easy and hard. Without much time spent in between, The Escobar Ruin jumps right from very easy to very difficult in one or two rounds, which was rather jarring. However, overall the balance was excellent. The Escobar Ruin does have a good measure of creativity, mostly in the story. The storyis very original and different from the usual DtS invasion fanfare, and the scenario offers a very good song that sets an excellent backdrop to the scenario's gameplay. The whole idea of defending a ruin is also rather original in and of itself, and the boss fights helped here. In my opinion, all this together lands the creativity between 4 and 5. The map manages to succeed in the difficult task of being both beautiful and fun to play in. The ruin was very well designed; being very pleasing to the eye and yielding fun DtS combat with its various openings. The area surrounding the ruin is also very beautiful, with nice plains with excellent terrain mixing interrupted by lush groves of trees and bushes. The instructions were very clear and easy to understand, and the author even provided a list of all the bonuses and the kill amounts at which they are acquired. Once again, the story was original and humorous, and the introduction and conclusion were both well written. The Escabar Ruin is Lord Basse’s winning entry to the 2009 Mini-game competition and also the sequel to My Fort – My Empire which was made back in 2008. The Escabar Ruin is a great Arcade mini-game filled with lots of humour and killing. It has a funny and enjoyable story and a great arcade style. I really enjoyed playing the game as it is short, fun and involves lots of killing. I could play it over and over again. The Escabar Ruin is a really challenging mini-game. The enemy come in waves that get harder every time. You only have a small number of heroes and a ruined fort to defend yourself with. There are boss levels which are quite hard too. However you get good heroes and two towers which help you beat the game. The Escabar Ruin is challenging but not impossible. The Escabar Ruin is really creative. There are some really great ideas in it and a really funny story. It is an arcade style DtS game which is quite unique and interesting. The scenario has some great trigger tricks and eye-candy along with a really pretty map design. The Escabar Ruin is built on a 25x25 map but has a great design. It is filled with elevation and forests. There is brilliant terrain mixing and awesome use of GAIA objects. The Escabar Ruin itself is really well designed. It is filled with damaged Aztec walls and Ruins. There are overgrown plants and weeds which make the ruin look even more realistic. A very good map design. The Escabar Ruin has a great Story. It is really funny and enjoyable. There are some great characters and they all add the story. The Instructions are clear and tell me what to do. There is also a nice hints page with the game settings and helpful Hints. The Escabar Ruin is a great Scenario which I highly recommend for and Arcade players.